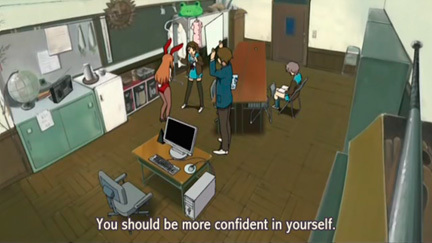 Haruhi Suzumiya is a high school girl who can unconsciously change reality, and her strange antics with her school club, the SOS Brigade, which she founded to investigate any mysterious happenings. 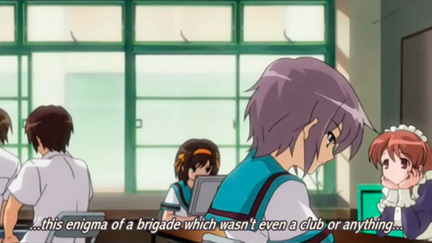 Haruhi forcibly drafts her cynical classmate Kyon who narrates the series, and similarly recruits three additional members into her club: the silent bibliophile Yuki Nagato, the shy and timid Mikuru Asahina, and the friendly “mysterious exchange student” Itsuki Koizumi. 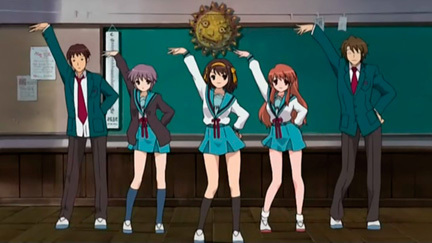 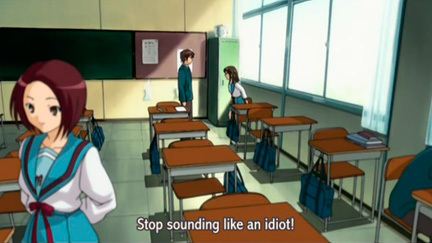 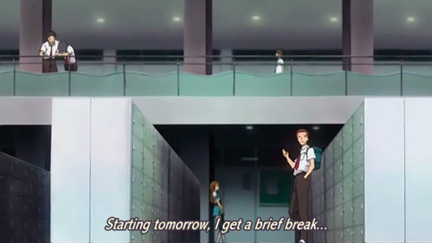 These members soon reveal themselves to Kyon as the extraordinary characters Haruhi is seeking (Yuki is an alien, Mikuru is a time traveler, and Itsuki is an Esper), sent by their various organizations to observe her and hold her reality warping powers in check by maintaining the illusion of a normal life. 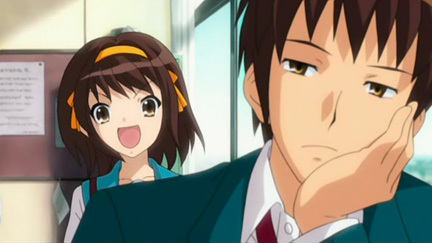 The Melancholy of Haruhi Suzumiya is a crazy series; though the series reputation in the U.S. is that fans think the series is weird, the fans in Japan just love the series (and they love the dance). 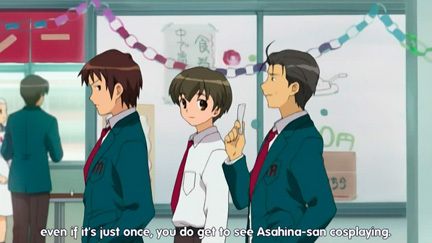 The main thing about the series that is noteworthy and unique is that the series has all of its episodes out of order. 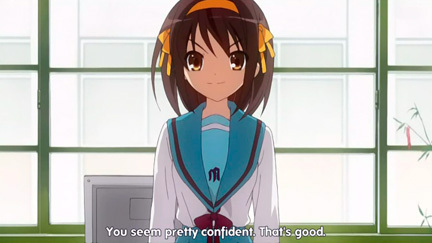 Also the main character (Haruhi) is very powerful and can control reality to her will, but she doesn’t realize she has those powers. 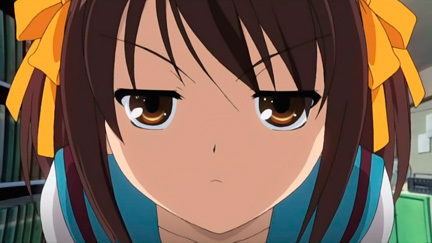 So though The Melancholy of Haruhi Suzumiya seems like it would be confusing because of the episode order, the series totally makes sense because certain things in certain episodes must happen before other episodes can become clear. 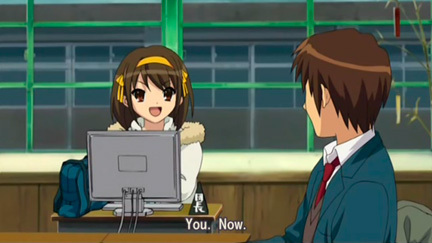 And though the episodes go out of order, they go out of order because Haruhi wants the episodes to go in a certain order; in a way Haruhi is controlling how the series is shown through her powers though she does not realize that herself. 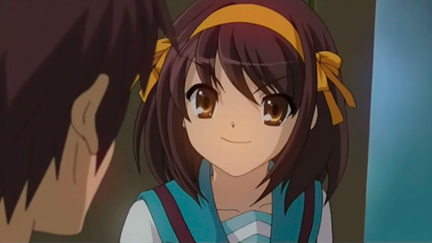 But anyway, what I really love about The Melancholy of Haruhi Suzumiya is the main character Haruhi Suzumiya; her energetic, overzealous, and arrogant personality is great because it shows that she can do whatever she wants and that she is not afraid of anything. 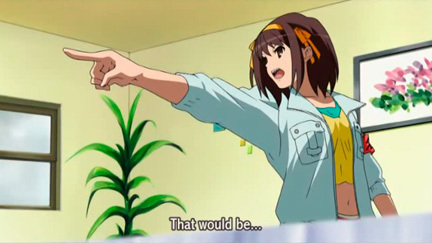 Haruhi Suzumiya is just an incredible girl.